Remember the aroma that greeted you when you walked downstairs on Christmas Day? Something's roasting in the oven, there are flowers on the dining table, the balsam tree stands in the center of the great room. That wonderful fragrance is repeated in our Olde Thyme Christmas handcrafted vegan soap. Slightly herbal, a little floral, a tad fruity, and a hint of balsam. Together, it's spectacular! 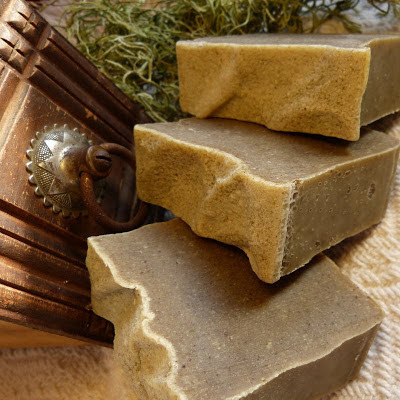 Made with all natural base oils, essential oils, and quality fragrance oils, Olde Thyme Christmas handcrafted vegan soap brings that same fragrance to your shower or bath. A deliciously fragrant and beautiful bar of soap with only the best ingredients. Each gorgeous and fragrant bar of 'Olde Thyme Christmas' comes wrapped in its own distinctive label with a list of ingredients on the back, and is enclosed in a clear cello bag, ready to give as a gift. Olde Thyme Christmas is the same soap as Thyme & Lavender, but with a Olde Thyme Christmas label. Olde Thyme Christmas is the perfect soap to keep in your shower, your bath, and be sure to get extras for guests. Great for stocking stuffers, or gifts for Teacher, Mom, Sis, Grandma, Auntie, Piano Teacher, Best Friend, or simply 'Thinking of You.' A bar of HomemadeSoapNSuch natural vegan soap is something everyone will remember, for these beautiful, handcrafted bars last a long time - as long as they're allowed to stay dry between uses. Better stock up now. We make our soaps in small batches. Olde Thyme Christmas is one you don't want to miss! P.S. This is the same soap as Thyme & Lavender.